There are many qualities that riders look for in longboards, but at the end of the day, everyone wants the same thing. They want a board that is just a ton of fun to ride. If this is the criteria by which the sector 9 Fractale is to be judged, it more than lives up to the task. The board itself is extremely lightweight. This makes controlling the board a breeze. One of the features that allows this board to excel at carving and sliding is the fact that it is extremely flexible. It is an all-around high-quality longboard. 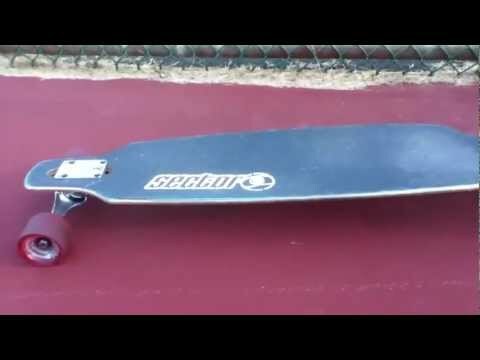 As you are cruising through your college campus or riding around the neighborhood, one of the first things that you are going to notice about this board is that it is extremely comfortable. Your feet feel well seated on this board. This leads to security and will give you the confidence to challenge yourself during the ride. You will feel at one with this board. It will instantly feel like it is a part of you. Again, this is due to the flexibility of the board. Flexibility though should not be confused with a board that is not sturdy. The 8 ply Maple construction guarantees that the board is going to be strong enough to take any beating that you give it. Because of its lightweight, high quality bearings and state-of-the-art trucks, the Fractale is a great board for experienced riders as well as beginners. Straight out-of-the-box, the board does not need any fine-tuning. New riders can simply hop on it and take off immediately. It is easy to turn and great for sliding. In comparison other boards, the Fractale is shorter. At only 36 inches, it does not have as much deck room as some of the other boards that Sector 9 makes. However, even at a smaller size, this board is able to provide stability. It has a wide 9 inch deck. It has a solid 26.375 inch wheel base that adds to the stability of the board. While not recommended for downhill style riding, the board will hold up under higher speeds. One of the reasons for this is the urethane riser pad that has been designed from the same shock absorbing material that is used for their wheels. The riser pad creates a smoother ride and protects the hardware by helping keep everything tight together. This will inevitably extend the life of your longboard. Additionally, the Fractale comes equipped with bearing spacers. The spacers provide perfect alignment for the bearings. They make the bearings faster, they make them last longer, and they guarantee that the wheels will be more wear and tear resistance. The Fractale is an extremely attractive and fun board to own and ride. New riders and veteran riders alike have commented on how much they enjoy riding this board.